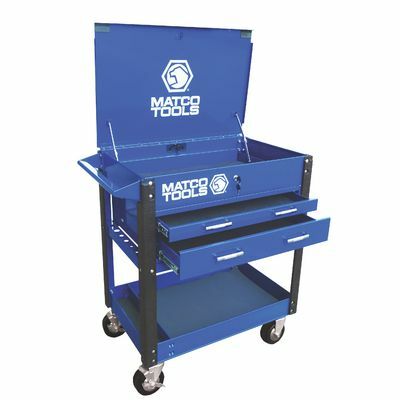 TWO DRAWER SERVICE CART BLUE is rated 4.3 out of 5 by 4. Rated 2 out of 5 by fleetmanager78 from Not the best for the price I just took delivery of this cart. Im replacing a Blue Point with one drawer. I don't care much for this cart. The top drawer is not deep enough to really put anything in. Each side has several holes in it for pry bars and screwdrivers and can be locked when lid is closed, that's ok, if your pry bars fit. I tried a 24" snap on pry bar and a 20" Matco, both handles were too long and wouldn't allow the lid to close. very disappointed. Rated 5 out of 5 by jjeffers from has good features all in all good prybar racks are only issue i have with this so use it for screwdrivers good for moving around my shop going to add or upgrade due to expanding tool selection. Rated 5 out of 5 by slinky from Great tool cart I have this cart. I'm wanting to expand or add to it. About to invest in more tools this year. Need more storage space. I work in aviation and it is easy to move from hanger to hanger. The height makes the top perfect for doing paperwork. Hope to keep it instead of buying a new one. Rated 5 out of 5 by ssmoto from great tool box purchased for school and love this cart, well built, well thought out, tons of space an great quality.